Figure: Streamlines of the flow generated by a line source coincident with the -axis. Note that the streamlines, , are directed radially away from the -axis, as illustrated in Figure 5.3. Note, also, that the stream function associated with a line source is multivalued. However, this does not cause any particular difficulty, because the stream function is continuous, and its gradient is single valued. is symmetric across this line. Figure 5.4 shows the streamlines associated with a dipole flow pattern characterized by and . Note that the flow speed in a dipole pattern falls off like . 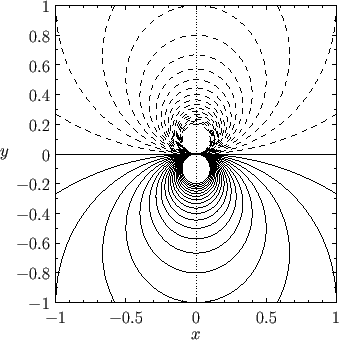 Figure: Streamlines of the flow generated by a dipole line source (with ) coincident with the -axis, and aligned along the -axis. 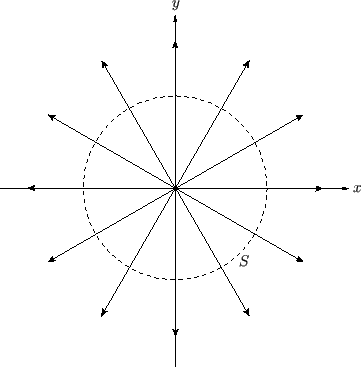 The flow is outward along the positive -axis and inward along the negative -axis. Positive and negative contours are shown as solid and dashed lines, respectively.